To procrastinate or not: the answer may be down to differences in how our brains are wired, a study suggests. It identified two areas of the brain that determine whether we are more likely to get on with a task or continually put it off. Researchers used a survey and scans of 264 people's brains to measure how proactive they were. Experts say the study, in Psychological Science, underlines procrastination is more about managing emotions than time. It found that the amygdala - an almond-shaped structure in the temporal (side) lobe which processes our emotions and controls our motivation - was larger in procrastinators. In these individuals, there were also poorer connections between the amygdala and a part of the brain called the dorsal anterior cingulate cortex (DACC). The DACC uses information from the amygdala and decides what action the body will take. It helps keep the person on track by blocking out competing emotions and distractions. "Individuals with a larger amygdala may be more anxious about the negative consequences of an action - they tend to hesitate and put off things," says Erhan Genç, one of the study authors, based at Ruhr University Bochum. The researchers suggest that procrastinators are less able to filter out interfering emotions and distractions because the connections between the amygdala and the DACC in their brains are not as good as in proactive individuals. Prof Tim Pychyl, from Carleton University, Ottawa, who has been studying procrastination for the past few decades, believes it is a problem with managing emotions rather than time. "This study provides physiological evidence of the problem procrastinators have with emotional control," he says. "It shows how the emotional centres of the brain can overwhelm a person's ability for self-regulation." Dr Pychyl is optimistic about the potential for change. He said: "Research has already shown that mindfulness meditation is related to amygdala shrinkage, expansion of the pre-frontal cortex and a weakening of the connection between these two areas". He said this showed that changing the brain was possible. Dr Caroline Schluter, the lead author of the study, said: "The brain is very responsive and can change throughout the lifespan." Productivity expert Moyra Scott thinks we need to take personality into account when motivating ourselves. "We need to recognise when we are procrastinating and have 'tricks' we can employ to get us doing something," she said. If you don't have an external deadline, use a timer to focus for set periods - for example, 25 minutes at a time with 5 minute breaks and a longer break every 90 minutes. Write a list of tasks but break it down into smaller, more specific ones. This makes them easier to action and complete. Try to minimise interruptions like email notifications. Putting your phone on airplane mode or going somewhere to work where you won't be disturbed will also help. Being "busy" is easier than doing the thing we are avoiding. Instead of doing the task at hand, we do other stuff instead and kid ourselves that we don't have the time. You do have the time. You just need to make it. 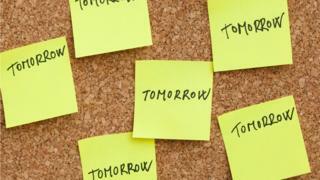 Viewpoint: Why do we procrastinate so much?